Global Chelating Agents Market size will surpass USD 5 billion by 2024 gaining the market by a CAGR more than 3%. Increasing paper & pulp market size is likely to be a principal driver for global chelating agents market in the forecast period. The industry will witness a notable growth on the account of the product’s extensive application in the manufacturing of paper & pulp products in order to meet the rising market demand. Paper-based flexible packaging materials demand in the packaging sector will witness growth owing to the developments in e-commerce and the increasing popularity of home delivery system of perishable goods, home appliances and other products. Increasing global awareness about using recycled paper products will also have a positive influence on the global chelating agents market in the upcoming years. Global paper & pulp industry registered more than USD 500 billion in 2015 and will have a decent growth in the forecast period. Non-biodegradable petrochemical based products, such as EDTA, HEDP, and DTPA, pose considerable threats to the environment as well as it has been found to be toxic under laboratory circumstances, causing reproductive and developmental defects in animals. Inherent property of the chemical to mobilize heavy metals from solid phases may pose a threat to the groundwater. This factor may restrain the global chelating agents market growth in the coming years. However, developments of novel biodegradable products made from natural raw materials may create ample opportunities for the overall market. Global chelating agents industry has been segmented into aminopolycarboxylic acid or APCA, organophosphates, sodium gluconate, and other types. APCA based products can be engineered to increase the affinity towards a particular metal ion. This segment accounted for a significant share of the overall industry, registering more than USD 1.5 billion in 2015 and will witness growth at close to 3.5% CAGR up to 2024. APCA based chelating agents market share will likely decline owing to development of new bio derived substitute products. Sodium gluconate is formed by the fermentation of glucose derived from corn and is non-toxic and harmless to humans. Its bio based nature makes the chemical biodegradable and environment friendly, increasing its popularity for general use. This product segment accounted for over a third of the overall chelating agents market size in 2015 and will have a fast growth in the forecast spell. Pulp & paper industry registered a considerable share of the global chelating agents market, where the product finds extensive application in mechanical pulp bleaching, chemical pulping, reduction of brightness reversion, chemithermomechanical pulping, and to control scaling of the surface. In 2015, this application segment accounted for over USD 1 billion and will have a healthy growth rate in the coming years. Growing demand for recycled paper products in packaging as well as stationery activities will boost the product demand up to 2024. Other applications considered in this market report are water treatment, agrochemicals, household & industrial cleaning, consumer products, chemical processing, and others. Growing demand for efficient agrochemicals in order to increase the crop yield to meet the increasing global food demand will have a positive impact on the overall chelating agents market. Increasing product application to enhance the agrochemical performance in hard water will augment the growth of this segment in the coming years. Agrochemicals sector registered more than USD 300 million in 2015, and will witness growth at over 4% CAGR in the forecast spell. Asia Pacific chelating agents market accounted for more than 40% of the global share in 2015 owing to the presence of numerous paper and agrochemical industries in China, India, Japan, and various south east Asia nations. The region will likely flourish at a CAGR close to 4% in the forecast spell. Growing industrial population in the region, on the account of cost efficient labor forces, and mandatory regulations regarding industrial waste water treatment will also support the regional growth. Europe chelating agents market was worth more than USD 850 million, due to the presence of several large-scale paper and pulp industries. Moreover, shifting industrialization towards eastern Europe will augment the overall industry growth in the coming years. The region will have an estimated gain of more than 3% CAGR up to 2024, losing its market share to the increasing demand in Asia Pacific and Latin America. The company share is fragmented with the presence of numerous large as well as medium scale organizations. Some of the important manufacturers in chelating agents market competitive landscape include AkzoNobel, Mitsubishi Rayon, BASF SE, EMD Millipore, Archer Daniels Midland (ADM) Company, Lanxess, Sigma-Aldrich, Tate & Lyle, Kemira Oyj, The Dow Chemical Company, Cargill Inc, Dabeer, AVA Chemicals, Shandong IRO Chelating Chemical, and Nagase ChemteX. Easy availability of raw materials and extensive R&D to develop novel and environment friendly products will boost the market in the coming years. The market participants focus on an elaborate product portfolio and continuously increasing the production capacity through strategic mergers and acquisitions in order to maintain their positions. 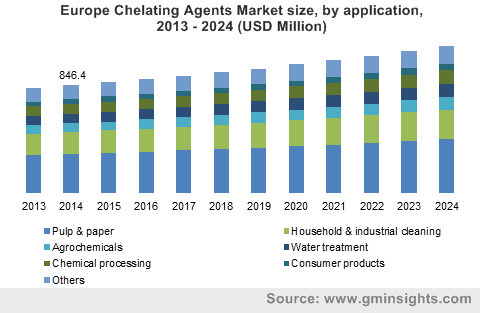 Global chelating agents market is versatile in nature with application areas including paper & pulp, agrochemicals, water treatment, cleaners, personal care products, chemical processing, food & beverage, textiles, metalworking, oilfields, and pharmaceuticals. The product provides desirable surface treatment in order to prevent scaling and also controls metal poisoning by binding to particular toxic metal ions. As a result, they are also useful to manufacture chelated micronutrients for easy absorption by plants. Bio-based products are naturally decomposable and will likely substitute the petrochemical based counterparts owing to the increasing environment concerns throughout the world. Sodium gluconate has gained popularity on the account of its superior chelating properties along with efficient biodegradability, and will likely have a significant growth rate in the overall market in upcoming years.